"Just fabulous," Carolyn Adams says as she passes children's art at the Barnes Museum site. As part of a Fresh Artists project, student versions of masterpieces will hang there for two years. Barbara Allen will receive $50,000 as one of 10 winners of the Purpose Prize, given to Americans over 60 who have reinvented themselves, tackling social problems in this latter stage of life. As founder of Fresh Artists, Allen, 62, of Lafayette Hill, in just two years has put more than 400 pieces of bold, lush, gorgeous "refrigerator art" from Philadelphia schoolchildren into corporate boardrooms and surprising spaces around the region and nation. She's used donations from those corporations to purchase $100,000 in art supplies for children in the city's neediest public schools. What is also telling about her story is how alive and hopeful she feels, and how her transformation came about. It wasn't a lightning bolt. Allen pursued a passion that led to a brilliant idea, one that keeps evolving. "This is my life, this is my mission," said Allen, who runs Fresh Artists out of five of the seven rooms of her home. She takes no salary. "I really believe I'm called to do this, and this is the most fun I've had in my life." Allen, the only winner from the area, will be honored Friday and Saturday nights at receptions at the Franklin Institute and the National Constitution Center. The Purpose Prize - $100,000 to five winners, and $50,000 to five more - is funded by the Atlantic Philanthropies and the John Templeton Foundation. Now in its fifth year, the prize is awarded by Civic Ventures, a California nonprofit focusing on getting older Americans involved in solving social problems and finding meaning in "encore careers." Civic Ventures is holding its annual three-day summit in Philadelphia, starting Friday. Prize winners are chosen from more than 1,000 nominations. Allen moved to Philadelphia at age 23 to work at the Philadelphia Museum of Art. After 12 years, she left to raise her two sons, who are both artists. About 10 years ago, she started volunteering in a charter school in Philadelphia where her son attended, and joined the board and became extremely active. Paul Vallas, former Philadelphia schools CEO, asked her to fill the new and cavernous headquarters on Broad Street with student art. The project, which she worked on with her son Roger, took two years. They would get student art, take a digital photo, and enlarge it in dazzling fashion. They hung hundreds of pieces. What Allen learned was that people loved the art and often wanted to buy it. She was adamant it wasn't for sale. One day, "an IT guy from Texas," she said, who was working in the building, pleaded with them to let him have a piece for his office in Texas. "I won't buy it," he said. "I'll make a contribution, and you can use the money to buy art supplies for the students." Allen and her son saw the wisdom and possibilities. In 2008, Fresh Artists was born. Many area corporations now hang Fresh Artists work in their offices and boardrooms. Fresh Artists teamed with the Barnes Museum recently - students at two elementary schools did their own interpretations of masterpieces in the Barnes collection. 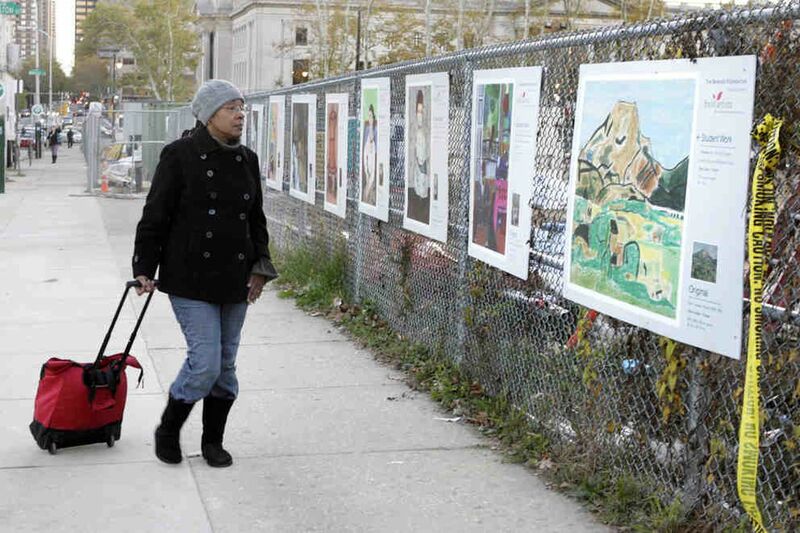 Three weeks ago, photos of the masterpieces side-by-side with student versions were hung along the fence on 20th Street, and will remain for two years as the museum's new home is built. Since beginning in 2008, Allen has come to see Fresh Artists as far more than its original concept. "Fresh Artists is all about access," she said. "Our whole raison d'être is to place children's artwork in unexpected places, boardrooms, and offices of decision-makers. One goal is "to create opportunities for vulnerable children to be philanthropists," she said. "They very often perceive they have little to give. Ten thousand children in our schools are classified as homeless; 76 percent of children in city schools live at or below poverty level. If you don't think you have anything, you can't imagine being a philanthropist. "We are telling them you have made something extraordinary and beautiful. This empowers children," she said. "It has changed lives. We have many stories of children who were on a bad path and we've been told it has completely turned them around." There is a second mission, to provoke the powerful, to make them curious, motivated, to let them see this fabulous art and stir their interest, their imaginations, to get them involved. "The idea is urban children are invisible to most people," Allen said. "The art goes into the boardroom and so with it go the stories of the child who made it. People in these corporate headquarters are going to wonder who is this little girl.. . . Most people think poor kids can't learn. Most people hear the educational system is so broken it's almost irredeemable. We are fighting to make sure that everyone understands these children have promise. They simply need access and we must find creative solutions to public education." Much of this vision, this transformation in Allen's thinking, has come from her association with other Purpose Prize winners. Last year she was invited to attend the annual summit at Stanford University as a fellow. She has stayed in close contact with many fellows and former winners, who helped her shape her vision. As a winner herself she will be invited to the summit every year. "I'm part of a fraternity of people, older people, who are changing the world, creating trouble in the world," she said. "These are my kind of people." Contact staff writer Michael Vitez at 215-954-5630 or mvitez@phillynews.com.